I've never driven anything quite like the Bentley Continental GT. It was unique when it came out in 2003 and eleven years later very few machines compare. Nothing offers its signature combination of presence, power, prestige and yes, sportiness. And that doesn't just apply to the range topping W12 but also the more 'affordable' V8 that came out last year. In fact, the British manufacturer has received such good feedback for the new power plant that they already have a new, more powerful version of it in the new V8 S that you're reading about. Monolithic. 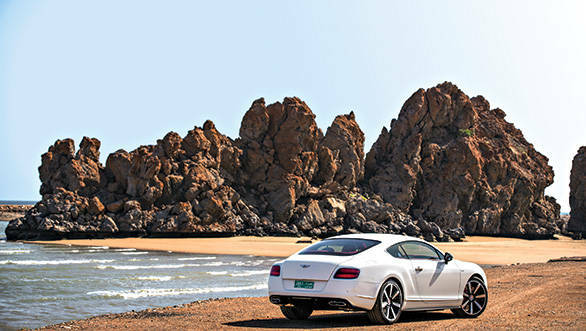 When you first view a Continental GT that's the immediate word that comes to mind. It appears hewn out of a single block of marble, a shape seemingly curved and smoothed and flattened by a high pressure jet of water that could only result in such a bold yet sophisticated design. An imposing face, strong shoulders and wide rear haunches attract plenty of stares even in supercar-rich West Asia. 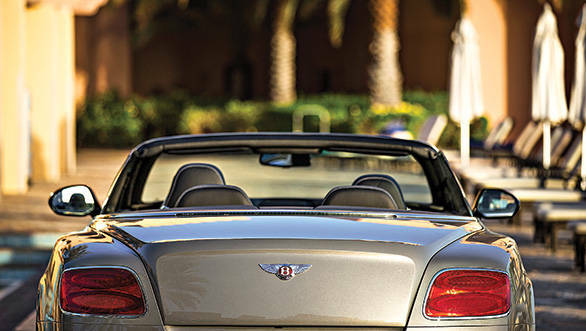 The coupe looks dynamic while the convertible is more suave and elegant. Neither are classically pretty but the design screams power, money and respect  things typical buyers like to have people know. With the V8 S changes are few and discreet like the subtle new splitter, skirting and rear diffuser. The symbolic 8-shaped exhausts remain but red brake calipers and V8 S badging will help admirers differentiate from the base V8. Step inside and you are introduced to a whole new level of luxury. An abundance of leather, wood and knurled metal greets your awed senses and if you don't like something you can always option an alternative. In true luxury tradition you can choose from a range of veneers and up to 17 different leather options. Classic materials mingle with modern conveniences like an 8-inch touchscreen that handles everything from navigation to entertainment and suspension settings. However, like most 'lesser' cars, the system is tedious to use. Not that you will bother once ensconced in the cosseting seats and gripping that handsome yet ergonomic wheel. This is a 2+2 but rear seat passengers won't be very happy. It's not unusable but neither is it very comfortable  good for a waft around the city but not so good for intercontinental travels. Push the start button that lies near that gorgeous bejeweled shifter and the twin turbo V8 barks into life with just the right volume and aggression. Part of the reason the V8 is so appreciated is the sound it makes  it's a perfect growl with a hint of brashness that's arguably better sounding than the bassy W12. 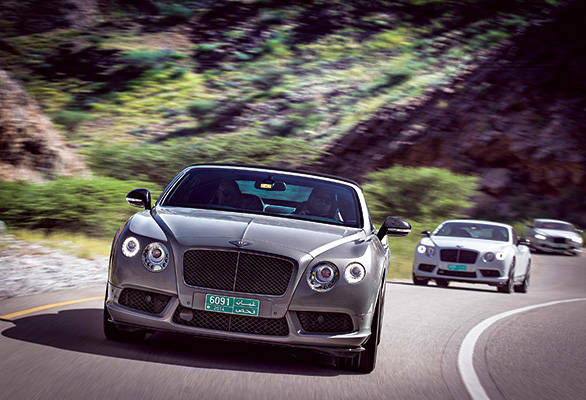 It perfectly suits the nature of the Conti GT not just in noise, but power delivery as well. The 3993cc twin turbo engine in the V8 S makes 21PS and 20Nm more than the standard V8 for a total of 528PS and 680Nm respectively. Those figures aren't far behind the 575PS/700Nm from the W12 but what impresses is the low end grunt. All that torque peaks at just 1700rpm which results in phenomenal drivability. The car pulls strong from any of the eight gears on offer and is just as happy lugging itself around at a tick over as it is when making peak power at 6000rpm. As always the ZF gearbox is nothing short of excellent. Performance is scintillating  4.3 and 4.5 seconds to 100kmph for the coupe and convertible respectively. Both have a top speed of just under 310kmph. But it's not just sheer performance this engine excels at; it also has the potential to be quite efficient. Thanks to a cylinder deactivation technology that cuts four cylinders when the car is at a steady cruise Bentley claims 9kmpl with a very careful right foot. That's hugely impressive for a car of this heft and power. At 2295kg (2470kg for the drop top) the driving experience is dictated by how well the chassis overcomes its bulk. For the V8 S, Bentley has dropped the ride height by 10mm, increased spring rates and also stiffened the suspension bushes and rear anti-roll bar. The result is a stronger eagerness to turn in and hold a line. This improved agility along with the power bump results in a tangible jump in driver involvement over the standard V8. Ride is moderately stiff and you will feel the discrepancies in our roads but the dampers have four levels of adjustability and the car feels supremely comfortable when left in Comfort mode on smooth tarmac. All wheel drive with a 40:60 torque split ensures secure and tenacious grip. 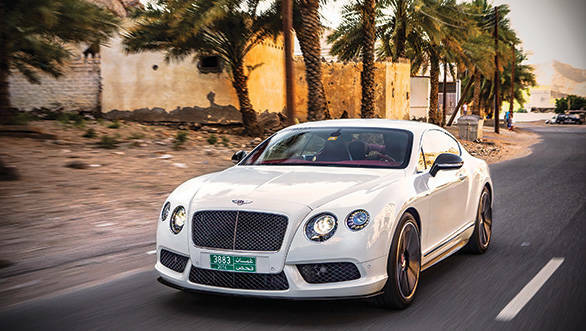 There is some body roll and a sense of weight as you hustle through corners but the Bentley takes it all in its stride, with a hint of complaint from the Pirelli P Zeros when speeds get very high. The optional and massive carbon silicon carbide brakes do a wonderful job of slowing the GT down and are worth specifying. 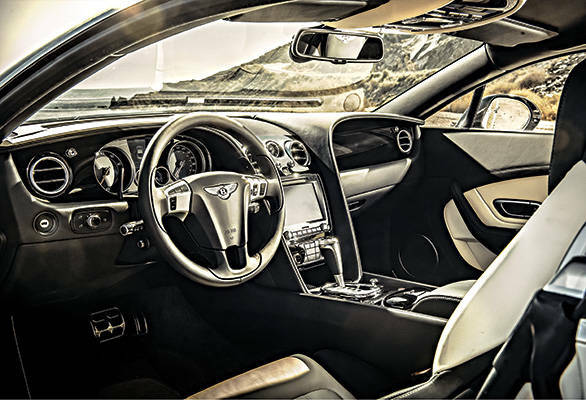 The Continental GT is a luxury car that involves the driver while spoiling him silly. It isn't sharply focused like a sports car and that shows in the progressive brakes and smooth throttle response that's quick but never aggressive. After all, this is a car to be enjoyed in a mature fashion, not thrashed. It's quite practical too with a big boot and usable ground clearance. Deliveries start in August with an expected price of Rs 3.2 and Rs 3.5 for the coupe and convertible. Personally, we'd have the convertible  yes it's slightly softer than the coupe but you'd never push a car like this hard enough to feel the difference. Besides which  if you plan on buying a car this special you might as well have the option to take the roof off.